The holiday season is upon us and with it comes the sights and sounds of Christmas. Regardless of your faith, December is often a special month of reflection, generosity, and family. Listening to my favorite carols and songs brings back long cherished memories of family and friends. For many, it’s a spiritual season with thoughts of life’s purpose. But others face much darker days with the struggle of addiction. Providing them and their families, relief from the pain would be the greatest gift of all. Last week, I attended my weekly Rotary Club meeting and listened as a young lady shared her story of addiction to opioids. The daughter of a Rotarian, she fought through tears as she shared her innermost struggle with substance abuse. She was an honor student, gifted athlete, and popular classmate. Yet, she still felt a lack of esteem and confidence, which led to handfuls of pills that wrecked her life, leaving a wide wake of personal destruction with family and close friends. I squirmed in my seat as I listened to her recount how her parents tried desperately to reach out with counseling and assistance. But in the end, they were forced to lock her out of their house. It was a story I was all too familiar with as my stepbrother faced the same insidious demons. The opioid epidemic is now considered the worst drug crisis in our nation’s history. These drugs kill more Americans than automobile accidents and opioids now claim more than 27,000 lives each year. Addiction knows no discrimination as every demographic segment has seen a dramatic rise in deaths from overdoses of prescription opioids and heroin. In 2014, friends from my High School lost their son to his struggle with substance abuse. Their family was close and Hendon was a popular and gifted young man and a talented athlete. Their son was one of the most likeable young men you would ever meet. But again, addiction does not discriminate – and another life ended entirely too soon – and another family faced unimaginable heartache. Earlier this year, I attended the funeral of a very successful young chamber member. She was the mother of two little girls. Bethany lost a battle that far too many wage. Her family and her faith simply could not compete with the pull of addiction – the momentary high that robs from the future. The young lady at Rotary ended by telling us how each day is a struggle, but she is winning that battle one day at a time. It takes courage, time and tons of support. Ultimately, the answer must begin with an acknowledgement that there is a problem and there must be resolve to overcome it. If I could have one gift this Christmas, it would be for our nation to put aside all the petty political bickering and focus on the real threats which face our great country, robbing each of us of our greatest living treasure – the sons and daughters of America. Let us hope as we face this year ahead, we do so resolved to ending the addiction crisis threatening our young people. United in a common cause to bring awareness to the issue and compassion to the cause. While we may not win every battle, no one should ever have to face the devil alone. The above column first appeared in the last issue of The Lake Norman Citizen Newspaper – Final Thoughts – November 29, 2017. Yesterday on a Face Book Page called I77 Animal House, I was taken to task by an anonymous poster who said my constant criticism of Governor Pat McCrory and his reluctance to cancel the I77 Cintra Contract was in a word “Disrespectful.” While it is true the Governor can, with a stroke of the pen, cancel this very bad deal, he has been steadfast in his refusal to listen to the Lake Norman Town Boards, State Legislative Officials, and more importantly the voters who sent him to Raleigh in the first place. While our chamber of commerce and business leaders have made the case why this is bad for business, now the NC Justice Department is investigating the company who was awarded the contract by NCDOT. 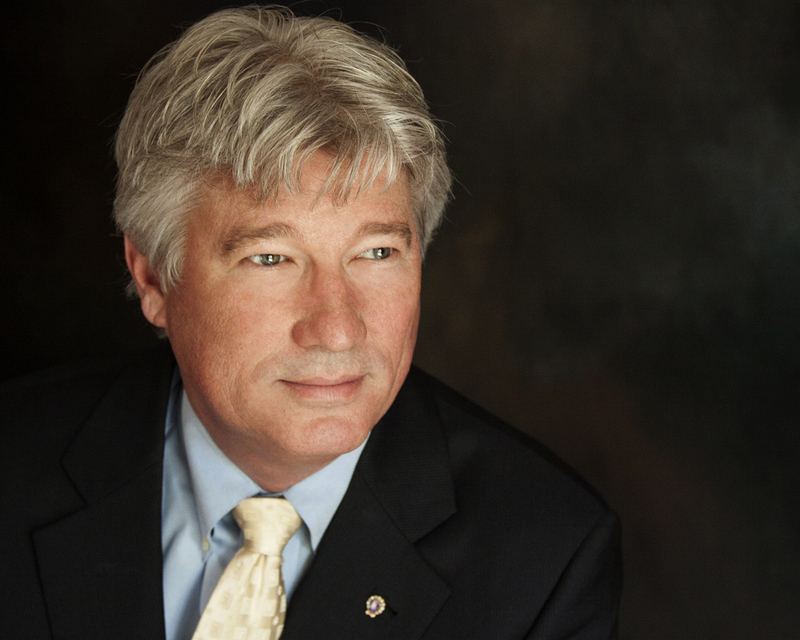 I have served the Lake Norman Chamber as its executive for twenty years with the primary objective of leaving this community and region better than I found it. Unfortunately the Chamber’s earlier support of this P3 Project, and my very real insistence we had to go along with this bad plan, was a mistake. Settling for the lessor of two bad deals still leaves you with a bad deal. One wonders whether the anonymous poster is just caught up in partisanship and will go to any lengths to toe the party line or was she one of the former elected or community leaders who pushed this project through and now cringes at the notion she too may have to admit a grave mistake. Anyone who has followed my career knows I like to write and many of those stories and articles have included stories about my Grandfather Russell who lost his battle with Alzheimer’s more than a decade ago. I loved working in the garden with granddaddy. From the time I was a little boy, he had me digging post holes and then chogging the dirt. No matter how deep I dug those holes, he always insisted just a little deeper. A few weeks ago, I was visiting my father down at the farm, watching the cows that would graze close to our white picket fence. We had to tear down the fence that granddaddy built and replace it with a plastic version that can better withstand the elements. But looking at the fence, I couldn’t help but recall one Saturday afternoon I was helping granddaddy repair the old one. As we toiled that hot afternoon making repairs, I shared with my grandfather problems I was having managing the staff of an office furniture company. 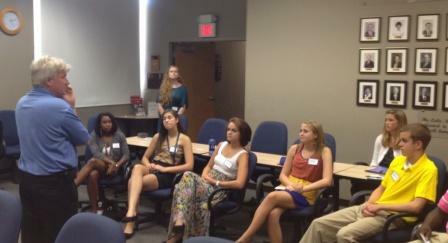 We had all agreed on sales goals and for a while things ran smoothly. But after a few months, our sales staff settled back into old routines and performance declined. After listening to me vent, granddaddy stopped his hammering, took off his old work gloves, and wiped the sweat from his brow. He looked at me for a second, gathering his thoughts, before he asked me to take a nail and strike it on the head as hard as I could into a board. I did as he asked. He then asked me to take the claw of the hammer and pull the nail out. Once again, I did as he directed, finding it a fairly easy task as the nail was driven in just so far. Granddaddy then asked me to take a new nail and drive it repeatedly into the board until the head was flush with the board. Upon completing the task he asked me to remove that nail as I had the other. I could not. The nail was flush with the board and there was no leverage to remove the nail. My grandfather in his wisdom explained just as I drove that nail in repeatedly, you sometime have to drive your point home with colleagues, staff… and sometimes a stubborn Governor. Some might call it disrespectful to question the foolishness of a fifty year bad deal. People can certainly draw their own conclusions. I prefer to look at it as fulfilling a promise I made to the businesses and citizens of Lake Norman. I will do everything I can in the time I have left at this chamber of commerce to leave my community and region a better place than I found it. And to that end, I will on every occasion I have, drive home the point – Toll Lanes at Lake Norman are bad for our citizens, bad for our communities, and bad for business. Would Granddaddy Russell be proud? He didn’t quit until the job was done and neither will I. Last year, many of us watched the Senate campaign between Thom Tillis and Kay Hagan play out on our televisions and splashed across the papers in the most expensive race in U.S. history. More than $103 million was spent as the candidates engaged in a spirited campaign. Thom is not just a huge supporter of business at the lake or simply one of our own. I have known the Senator and his wife Susan for more than a decade and they are both personal friends. I cringed watching the attack ads on TV and seeing the messaging in newspapers. Much of it was baseless and untrue. I’m also quite certain the same could be said in regards to the attacks on then Senator Hagan. A product of South Carolina, one of our native sons was a master of negative advertising. 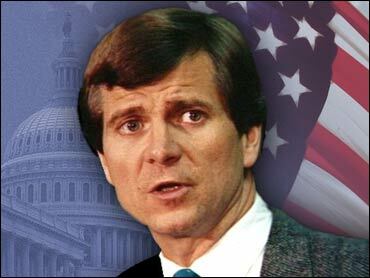 The late Lee Atwater had few rivals in his ability to spin, boxing candidates into corners, and helping his party and their candidates onto victory. In the last few weeks I have read things on social media about local candidates for office that I think would make even Lee Atwater blush. Social media such as Face Book and Twitter allow anonymous critics to hurl filth with the only true goal – to maliciously hurt another individual. Some keyboard cowboys and cowgirls launch personal attacks that they would never do face to face. What some claim as fact is nothing more than pure fiction designed to prop themselves up by pulling others down. In the end, it is our community which is hurt most by the baseless accusations and negative attacks. Negative campaigning is nothing new. The founding fathers of our country did not get along either. Even George Washington was falsely accused of being senile by those who sought to take his office. The words we choose can be daggers to the soul or inspire others to reach new heights. In the end – the choice is ours. It seems as if the last few weeks have been nothing but a flurry of political activity. 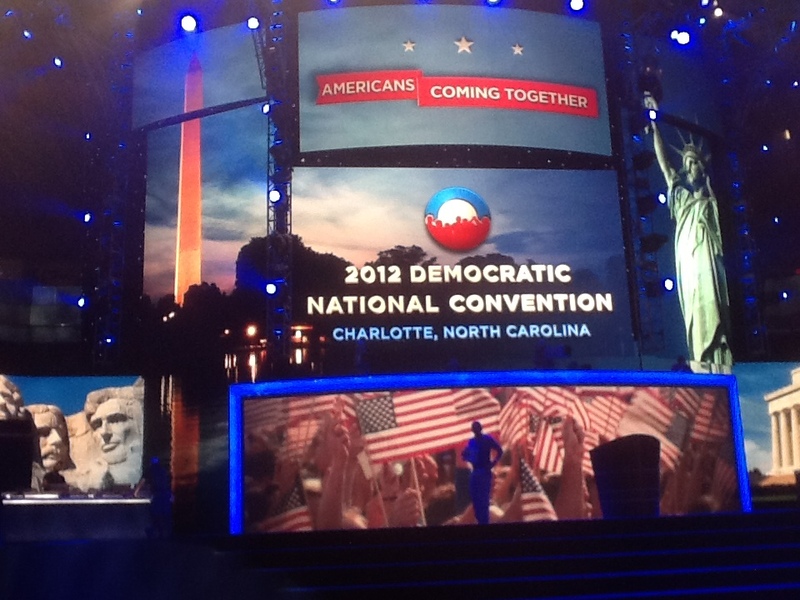 The first week of September, the Charlotte region hosted the Democratic National Convention. Later that week, a delegation from the Chamber and Visit Lake Norman made our annual trip to Washington DC to meet with our federal delegation and to attend the N.C. Business and Economic Development Summit with members of the North Carolina Congressional Delegation and Senate. These past two weeks we have held two candidate forums featuring our candidates for United States House District #9, Mecklenburg County at large and District #1, and the new N.C. House Seat District #92. A few weeks ago, I was interviewed by Kristy Etheridge from WBTV who asked did our businesses see much of an impact from the DNC? I told Kristy that months ago, we cautioned area retailers and hospitality businesses from being overly optimistic that delegate spending would be a “silver bullet” for our local economy. In speaking to some local business owners both here and in Charlotte, as well as DNC vendors, sales were for the most part disappointing. While our hotel industry did quite well, some retailers in Charlotte were actually hurt in that regular customers and clients did not patronize the businesses during the DNC. The real strength of the DNC was its ability to showcase our area to not only the nation, but the eyes of the world. A political event of that nature is perhaps second only to the Olympics in terms of international exposure. Media coverage, as well as national and international awareness, focused on the Charlotte and Lake markets. Before the gavel sounded at Time Warner Arena, our Chamber had already been contacted by a Senior Producer with RTL Netherlands, a television news organization, on giving our perspective on the Patient Protection and Affordable Health Care act (Obama care). Their producer had seen the media coverage of our August Focus Friday on the subject. Perhaps Vinay Patel, whose company SREE owns Marriott’s Courtyard and Residence Inn in Huntersville, summed it up best at this month’s Visit Lake Norman Board meeting when he pointed out the DNC proved to the world Charlotte is no longer a second-tier city when it comes to hosting an event. While I did not have a chance to attend any of the official DNC, I did tour the facility and had a chance to have dinner with a close friend I had not seen in over a decade. 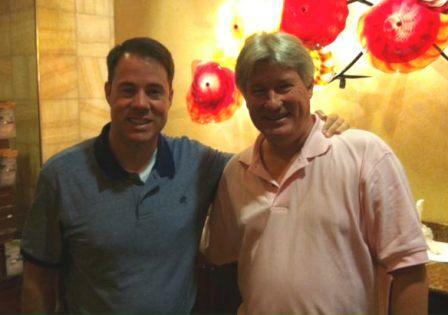 Tom Coderre, the Chief of Staff to the Rhode Island Senate President and a former State Senator himself, attended the DNC as a delegate. Tom was a National Vice President of the United States Junior Chamber of Commerce (Jaycees) in 1992-1993 when I was the National President. 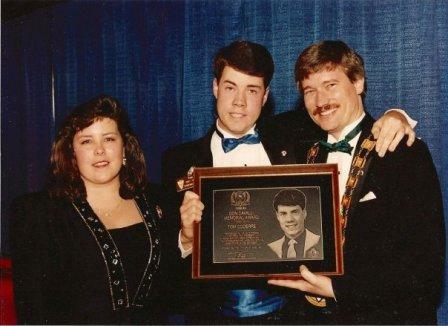 One of the youngest NVP’s to ever serve the Jaycees, he was assigned to many of the larger states like Texas and Kansas. In the beginning, some of the Jaycee leaders from those states could not imagine such a young man from such a small state could be that much of a resource. However, Tom soon proved true the adage “It’s not the size of the dog in the fight but the size of the fight in the dog.” Among the ten National Vice Presidents, Tom was recognized at our Annual Meeting in Greensboro as the Most Outstanding National Vice President and received the coveted Don Cavelli Memorial Award. Tom and I avoided most of the political issues of the day and focused on what we were doing with our professional careers. However, before we went our own ways he introduced me to other delegates from Rhode Island including his Mayor from the City of Providence – Angel Taveras, and I had the chance to meet delegates from Maryland. Travelling back home in my convertible that night, an old Rod Stewart song came on the radio. I listened to the refrain of the familiar song I had heard so many times before… “So remember, every picture tells a story don’t it” In this case… I couldn’t agree more! American humorist Will Rogers once said, “This country has come to feel the same when Congress is in session as when the baby gets hold of a hammer.” My mother loves to tell the story that as I child I simply destroyed my toys. In 1964, at the age of five, mom purchased one of the new Tonka toys from West Main Hardware in Rock Hill. The salesman stated this new line of construction toys made of metal were the perfect toy for kids who were hard on their toys. Mom said she put me in the backyard, locked the gate, assuming I was good for the afternoon. She claims within the hour she saw me sitting on the ground beating the dump truck with a hammer. Perhaps more priceless was the shocked look on the salesman’s face when mom walked back in with the remnants of a bashed in yellow dump truck. 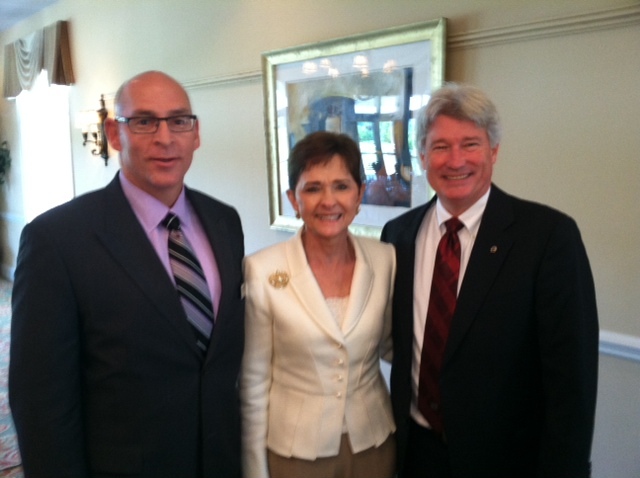 One of the first elected officials I met when I arrived at the Lake Norman Chamber was Representative Sue Myrick. Rep. Myrick has represented North Carolina’s ninth district for 18 years. There is no question she has been an outspoken spokeswoman for conservative principles,America’s security, and business. Sue, as she prefers to be called, served two terms as Mayor of Charlotte, a term on the Charlotte City Council, and ran a successful advertising firm. She’s also a breast cancer survivor and has been a staunch supporter of American healthcare – sponsoring a law to provide Medicare coverage for mammograms and pap smears for low-income women. The Chamber has made annual trips to Washington DC for more than a decade and Sue always made time to listen to our delegation about issues of importance to the Lake Norman region. She was just as accessible back home in the district hosting town hall meetings, business briefings, and legislative forums. This month as we celebrate Small Business Week – May 21-25, it is fitting that we have Rep Sue Myrick on May 11th to get us focused. The Chamber will honor Rep. Myrick for her unwavering support of business at the luncheon as she caps off a wonderful career of public service. I’m not sure Will Rogers was flattering Congress with his remarks but I am certain that Sue Myrick knew when to use her velvet glove and when it was appropriate to bring out the hammer. Unfortunately, I didn’t leave many hand-me-down toys to my brother Todd. But I am certain Rep. Sue Myrick leaves the citizens of District Nine and our nation much stronger because of her sound judgment and commitment to conservative values and principles. Sue once told our Chamber delegation, “We have to make those tough choices so our America will be there for our kids and our grandkids.” Representative Myrick went to Washington to make a difference – to make her district and her nation better than she found it – and she did. It is her legacy of leadership. As Bruce Springsteen – “The Boss” – was strumming on stage at Time Warner Cable Arena, anxious politicians and supporters were glued to laptops and television screens watching the results of Tuesday’s election results trickle in, precinct by precinct. While the region will see two new mayors in Charlotte and Mooresville, for the most part voters returned incumbents to continue the job they were doing. In Huntersville, a conservative seat on the board was filled by a newcomer to the political scene, but one whose conservative views may very well match those of her predecessor. Cornelius saw the three incumbents returned to continue their public service and were joined by two experienced planning board members who may again closely match the experience and progressive vision the former commissioners share. Certainly, in neither Huntersville nor Cornelius, will there be a major shift in the course the towns have been headed when it comes to land planning and zoning decisions. The parity in the elections of Huntersville and Mooresville’s Mayoral contests show just how split the towns may well be in what voters are seeking from their chief elected official. While the political philosophies in Huntersville could not be more stark in Brian Sisson and Jill Swain, the electorate was almost evenly split in the closest election I can certainly recall in that community. In Mooresville, only 16 votes separated incumbent Mayor Bill Thunberg from challenger Chris Montgomery. That race centered on fiscal policies – the same issue in which Sisson and Swain were most sharply contrasted. In the election of our regions’ Mayors – Anthony Fox, Jill Swain, and Chris Montgomery – all three find themselves edging out their opponent with less than 2% separating them from their challenger. (Mayors Tarte and Woods were unopposed.) Each needs to examine carefully the philosophies, views, and talents from their challenger that the public embraced. It will not come natural, but they should try to seize on those traits and beliefs in which nearly half their community supported and work to build a strong team and consensus on their board. 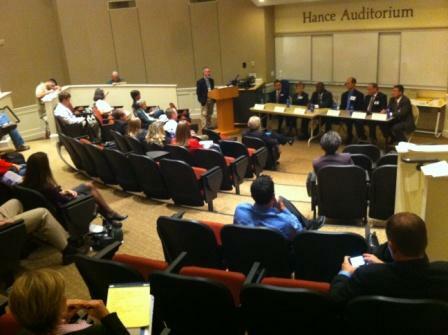 It will be much easier in Davidson where the two political newcomers already embrace much of the philosophical direction of their predecessors based on the feedback we heard in the Chamber’s candidate forums last month. Matthew 22:14 states, “Many are called, few are chosen…” Last evening, some very good people were elected to lead our communities. Some other very good people were not. Such is politics. Few are actually given the opportunity to serve. And let us not dare fail in that task.